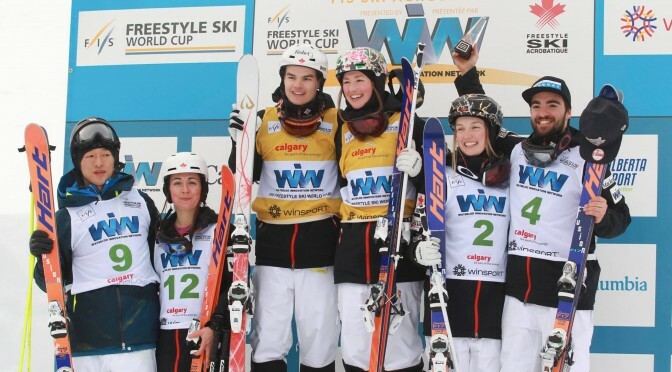 Calgary (AB), Canada – Saturday was another incredible day for the Canadian Mogul Team on Saturday with a second consecutive World Cup women’s podium sweep and the top two spots on the men’s podium. Chloé Dufour-Lapointe of Montreal, the overall women’s FIS Freestyle Moguls points leader, finished in first place with a score of 77.42 narrowly beating out younger sister, Justine, who finished with 77.24. Andi Naude, of Penticton, B.C., finished third (74.11) for her second career podium and her first on home soil. 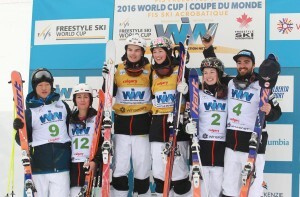 The sweep comes exactly one week after the Dufour-Lapointe sisters, including Maxime, swept the FIS World Cup podium at Val Saint-Côme, Quebec. The Canadian women’s team showed its depth on Saturday by holding five of the six spots in the super final. Audrey Robichaud (Quebec City, Que.) finished fourth and Maxime Dufour-Lapointe (Montreal, Que.) finished sixth. Mikaela Matthews, of Frisco, Colo., lead the charge for the U.S. women, finishing 8th to secure the 12th top-10 finish of her career. Her skiing and jumping were strong, but slower speed in her first final run kept her out of the top six for the super final. Ali Kariotis followed in 11th, Nessa Dziemian was 15th, Jaelin Kauf 19th, Keaton McCargo 22nd and Heidi Kloser 26th. “I just cleaned up my whole run this week,” said Matthews. “I struggled with the exit on top air during my comp run in Val Saint-Côme, but I tried to make sure everything was really clean. After not making it all the way around on my back full in training and getting a little mentally freaked out, I was able to put down a really good one off the bottom air during the comp and was happy with that. For the men, Mikaël Kingsbury, of Deux-Montagnes, Quebec, continued his torrid streak on the record books by winning his 31st career FIS World Cup. Kingsbury’s super final score of 81.63 earned him in the victory, joined on the podium by teammate Philippe Marquis of Quebec City, who finished with 80.51. Japan’s Sho Endo scored 75.34 to finish third, the only competitor not from Canada to land on the Calgary podium. Saturday’s victory is the sixth consecutive win in Calgary for Kingsbury and his third consecutive victory on the World Cup tour. Kingsbury has now won 10 out of the 11 last mogul World Cups. “Phil (Marquis) was skiing well all day and I knew that I had to push myself to beat him,” said Kingsbury. “Today wasn’t the best skiing of my life since the course was so challenging for everyone. I still think I jumped pretty well and executed when it mattered the most. We were able to follow our game plan and it brought us results. Marquis is coming off two straight fourth-place finishes to start the season. Finishing second in Calgary moves Marquis up to second overall in the FIS rankings behind Kingsbury. For the U.S. men, Dylan Walcyzk (Rochester, N.Y.) and Jeremy Cota (Carrabassett Valley, Maine) put down competitive runs, qualifying in sixth and ninth, respectively. Cota chose to up his degree of difficulty on the top air in final one, but was unable to cleanly execute and missed the super final. Walcyzk finished his day in 14th. Troy Murphy was 21st and Bruce Perry Jr. 23rd. Bryon Wilson, of Butte, Mont., did not finish. The World Cup moguls teams now head to Deer Valley, Utah, for a FIS World Cup double header this week, competing in a moguls event on Thursday and a dual moguls event on Saturday.